Being a prolific screenwriter and producer, Carlström has worked in the film and TV industry for nearly thirty years and is known for delivering suspenseful, dark and smart thrillers with emphasis on character and interpersonal relationships. The feature films Hunters and Hunters 2 (1996, 2002), about the policeman Erik Bäckström, have become modern Swedish classics. The new TV-series of the same title will return to the universe of the films and premieres on C More November 14th. It will be broadcasted on the Swedish network TV4 next year. 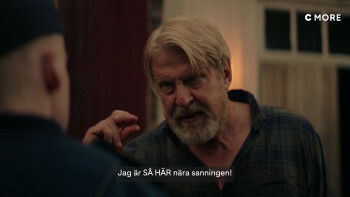 In Hunters, the headstrong policeman Erik Bäckström, once again portrayed by Rolf Lassgård, leaves Stockholm behind to return to his hometown in the north of Sweden – this time for good. The six-episode series is written by Björn Carlström and Stefan Thunberg and directed by Jens Jonsson. Hunters is produced by Harmonica Films and SF Studios in co-production with C More/TV4 and Filmpool Nord. The modern Swedish film classic Hunters is to return in 2018 as an original TV series on C More. The series is based on the feature films Hunters from 1996 and Hunters 2 from 2011. Rolf Lassgård is set to play police Erik Bäckström as in the previous films. Main writers of the six episodes are Björn Carlström and Stefan Thunberg. Jens Jonson is to direct. The series is produced by Harmonica Films and SF Studios and is a co-production between C More/TV4, SF Studios and Filmpool Nord. Hunters will premiere on C More in 2018, and will then be broadcasted on Swedish network TV4 as well.